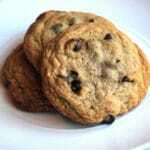 I don’t know about you, but, for me, a good chewy chocolate chip cookie can just make my day. Several years ago, I watched an episode of Good Eats on the Food Network in which Alton Brown (awesome guy, by the way) talked about the three main ways people like to have their chocolate chip cookies. These three ways included: the chewy, the puffy and the thin. 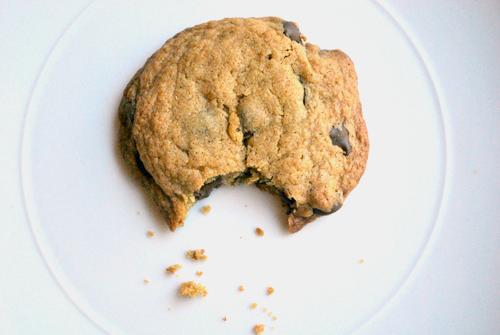 Confession: I am totally a sucker for a good chewy chocolate chip cookie. As for the puffy and the thin: ehh. I kid. Truthfully, I’m pretty much a sucker for any kind of chocolate chip cookie, though I do prefer the chewy. Anyways, I tried Alton’s recipe for “the chewy” and absolutely loved it. I’ve used this recipe for years now and, you know what? I’ve never made any changes to it. In my recipe binder (yes, I have a recipe binder and it’s even labeled “Recipes” in case there were any confusion), this recipe has food stains and smears all over it but it lacks any pen scribbles from me. To me, that’s the sign of a great recipe and a messy chef, apparently. The real key ingredient for this recipe is bread flour. Bread flour has a high amount of gluten, which, when added to water, creates an elastic, rubbery consistency throughout the dough and, subsequently, makes the cookie more chewy. That’s why I use bread flour in my pizza dough recipe as well. 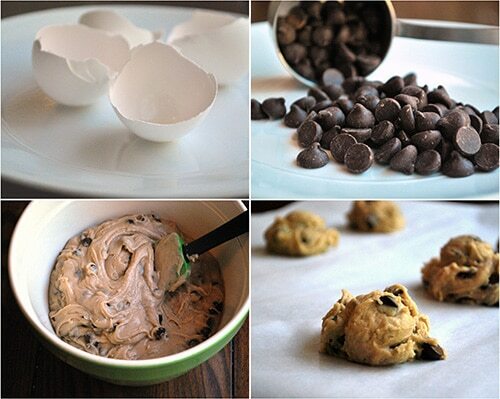 Have these cookies with milk, ice cream or just by themselves…they are super tasty. Thanks, Alton, for a great recipe! 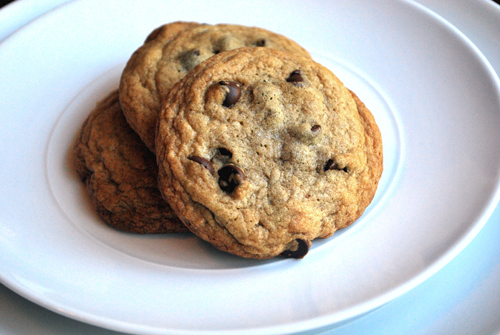 I've used this recipe for Chewy Chocolate Chip Cookies for years now and, you know what? I've never made any changes to it. Chill the dough, then scoop onto parchment-lined baking sheets, 6 cookies per sheet. Bake for 11-14 minutes or until golden brown, checking the cookies after 5 minutes. Rotate the baking sheet for even browning. Cool completely and store in an airtight container. I remember when you used to make these when I was playing videos games way before kids lol. Thanks so much for the cookie recipe! A special someone in my life is mad at me, so I made thes to try to clear things up between us. I am excited to see if it works! These are delightful!! I made them organic and they turned out great =) Thank you!! They really love it especially the I.T. boys. Jonalisa, I have made this recipe before with both light and dark brown sugar. Each time, the cookies turn out great. These particular cookies were made with light brown sugar. I checked Alton’s recipe and he doesn’t specify which type either. So, I guess it’s just a matter of personal preference. I tend to prefer the light brown sugar myself. Hope that helps. Would love to know how your cookies turn out! i tried this recipe and used regular flour and cane sugar instead of brown sugar. I was a bit disappointed, and I think I must have done something wrong somewhere, though I don’t know what. The cookies came out really hard for some reason, not chewy. Just… crunchy, as though they’d been left out for a while. I didn’t bake all of them so I’ll try again this week-end but… very sad these didn’t turn out. Hi Nairi, I’m so sorry your cookies didn’t turn out well. I have never tried changing the flour type or the sugar, so that may be the culprit. Also, everyone’s oven temperature varies, so keep an eye on the cookies and possibly take them out sooner so they don’t get too hard and crispy. I’d recommend taking them out of the oven just a minute or so before they actually look done. I hope that helps! Thanks for commenting. Please update us after trying out the recipe again this weekend. Please don’t give up! These cookies are worth it! Good luck! That probably has more to do with your substitution for brown sugar than cook time. The molasses in brown sugar is what gives the cookie it’s chewiness. Cookies made only with white sugar will always be crisper. I love chocolate chip cookies and these are my favorites! Hopefully Lacey will make some peanut butter cookies soon because I have been craving them. Peanut butter cookies do sound tasty! It’s hard to go wrong with an Alton Brown recipe. We tried these and liked them too. Steph, I absolutely agree. With all that science behind him, Alton is pretty foolproof. Thanks for stopping by and commenting!